6 & 7 May will be a genuine Brussels-Europe Weekend, with two simultaneous events: the Open Day of the European Union (6 May) and the Brussels Iris Festival (6 & 7 May). Expect some unique and exclusive visits of, among others, the Europa Building, the new headquarters of the European Council, and Station Europe, the European Parliament’s new futuristic visitors centre. You can also enjoy hundreds of free concerts, workshops, circus acts, street theatre, sport and activities for kids as well as debates, information stands and guided tours in different languages. It’s the ideal occasion to discover one of the capitals of Europe, for a day or for the whole weekend. Here is some practical information and some highlights. On Saturday 6 May you might want to discover the marvellous Europa building, the new headquarters of the European Council and a gem of contemporary architecture. It will be open to the public for one day only on 6 May. 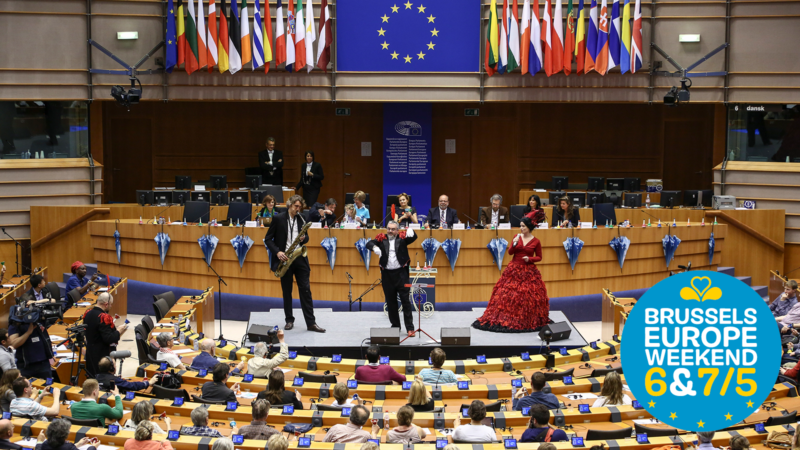 The European Parliament will, among other things, offer ‘Democracy in Action’ which will enable you to participate in a debate in the European Parliament hemicycle. You will be able to visit Station Europe, the Parliaments’ new futuristic visitors centre and the brand-new House of European History. The Parlamentarium is of course always an excellent option – try the temporary exhibition ‘Eleven Women Facing War – as is a visit to the Berlaymont building and the Jean Monet Commissioners Room with its spectacular view of Brussels from the building’s top floor. You might also want to grab a bite at the Bread Festival on Schuman roundabout. And that’s just a small selection on things on offer that day. The Iris Festival – the annual popular festival celebrating the Brussels-Capital Region – runs throughout the weekend. Saturday will offer you free guided tours and typical Brussels heritage in four of Brussels’ neighbourhoods, including Molenbeek! If you’re a dance aficionado you might want to end your day (or start your night) with the Electro Night, a free concert in the centre of Brussels, starting at 7 pm. The party goes on with ‘Iris Nights’, a selection of the best of Brussels night life. On Sunday, the ‘Party in the Park’ in Brussels park offers hundreds of animation activities, including Belgian and international food and beer tasting sessions. The weekend ends with the ‘We are Belgium’ free concert, with among others Ozark Henry, Stijn Kolacny (Scala) leading a Brussel international choir and the National Orchestra of Belgium. And of course, Brussels has a lot more on offer than just these festivals. Staying in the European spirit you might want to discover Mini-Europe, which displays miniature versions of the Eifel tower, the Berlaymont and so many other gems of national architecture from across Europe. Curious foodies should try at least one of the city’s 32 ‘Brusselicious’ restaurants. The new label for restaurants and ‘fritures’ rewards establishments serving high-quality typical Brussels cuisine. Why not marvel at the Atomium or the magnificent and completely restored Grand Place. Brussels also has many world class museums for you to visit, such as Autoworld, BOZAR – The Centre for Fine Arts, the Royal Belgian Institute for Natural Sciences, the Comic Strip Centre and the Musical Instruments Museum. The Belgian capital also hosts numerous temporary exhibitions that are well-worth a visit, such as the Rik Wouters exhibition at the Fine Arts Museum, the Malta. Land of Sea exhibition at BOZAR and the Pierre & Gilles. Clair Obscur exhibition at Ixelles Museum. Here’s one final tip for your weekend: book (in advance) a guided tour and learn everything there is to know about the many themes and movements that Brussels is famous for, such as comic strips, contemporary art, Art Nouveau and Art Deco. Brussels: general information, getting there & lodging?